This release has been announced for some time. The Box Whisky The Explorer is the third installment in the Early Days Collection. The first two releases were The Pioneer and The Challenger. The fourth and last release in the series is due in December 2015 and will be called The Messenger. The Explorer is largly matured in bourbon casks of different sizes; 40 l, 100 l and quarter casks (130 l). Ten percent of the casks that went into making this whisky are fresh oak of three different types; Swedish Oak (Quercus Robur), Hungarian Oak (Quercus Petrea) and American Oak (Quercus Alba). These fresh oak casks have also been, to make matters even more complicated, subject to three different levels of toasting and charring. We must, of course, not forget that 61 % of the whisky making up this creation was made with the peated new make, whilst the rest was born as unpeated new make. All in all it certainly sounds as if the master distiller, Roger Melander, has had a lot of fun in his lab (ie. the warehouses). The age of the whisky that make up The Explorer is from 3 years and 3 months old, up to about four years old. 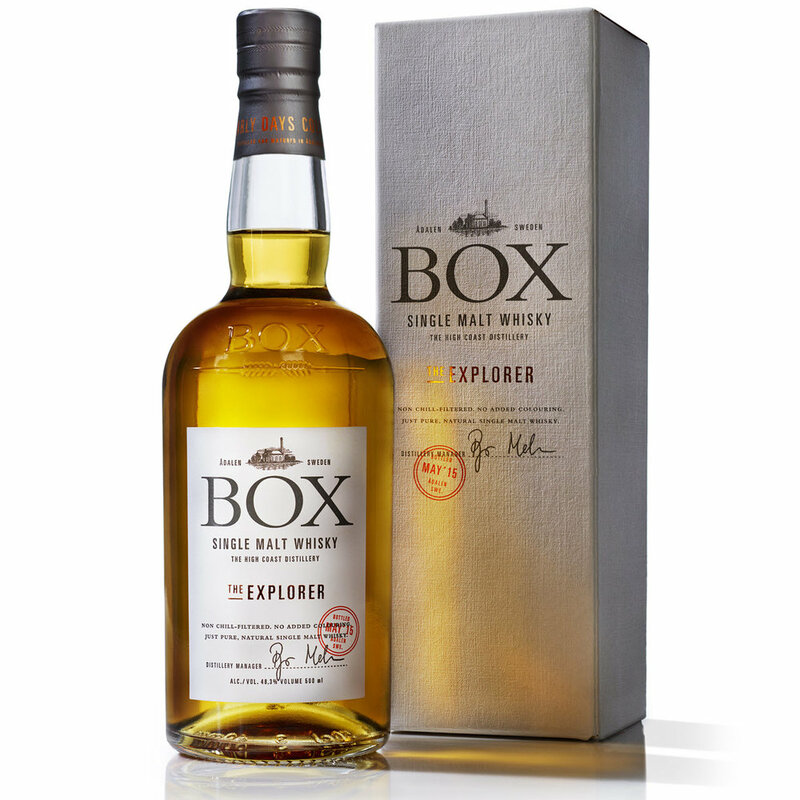 Box Whisky The Explorer is a release limited to 10 000 bottles, and will be available to buy on June 5 2015 at 10 am. Be prepared to fight for the bottles. The first two installments sold out in a matter of hours. The sales price is SEK 837 (item number 9216402). Now, before I go ahead with my usual tasting notes, I must confess that my wife and I had to do a half-blind tasting when we first got our hands on this whisky. So we poured ourselves three glasses each - lining up The Pioneer, The Challenger and The Explorer. Making sure the glasses were labeled underneath (where I could not see the label), the glasses were switched around until I was fairly dizzy. Then we started nosing and tasting. Light, fresh and waxy on the nose. Pepper and oak on the palate - a bit dirty. This one takes a long time to open up. Feels young, and I would now have scored it slightly below what I originally did. Warm apple pie, leather, cinnamon and mild sherry notes on the nose. A bit herbal and green to taste. Compared to the other two this one is sort of an Even Steven, it falls in the middle every wich way I look at it. Fruity and sweet on the nose. Spices and ashes to taste. Licorice finish. Feels older than the first two, although the age difference is minor. All three are very well integrated, and lovely whiskies for such a young age. Trying to find common characteristics is quite difficult here, and could very well be down to cask influence, with a lot of small casks having been used. All that being said we did find some commonality between them; a more or less fruity and light character on the nose, and a slightly spicy taste with notable licorice on the finish. Curious about the slight herbal characteristic to the finish as well. Nose (22/25): This is a fruity and peaty whisky. The fruits detected are quite tropical in theme; featuring pineapple and melon in the main roles, supporting roles by grapes (grape juice) and strawberries (bathed in Prosecco). The peat is wood smoke and ashes. It is a quite light nose, and it feels very well integrated for such a young whisky. Give it time and the oak becomes a bit more apparent - caramel, grandma's home-made caramel pudding, and vanilla. On my second round (two days later) I have to add honey as a characteristic - I am sticking with the rest of my description though. Taste (22/25): Big on pepper! The smoke is very much present as well - wood, chocolate and ashes. What?! Someone burned down the wooden chocolate factory? The fruit is not as clearly defined on the palate - I find some lemon zest and hints of apples. Oak and ginger is to be found as well. It has a full-bodied and smooth mouthfeel. Upon a second visit I have to note that the mouthfeel is very nice, like rich honey with bits and pieces af peppery ashes. Finish (22/25): The smoke and peat now take on flavors of licorice and coffee. There's more ashes here now, and lots of fresh licorice! Quite long finish for such a youngster. Balance (22/25): A thoroughly enjoyable young single malt from Sweden. I believe this is the best effort from Box Whisky so far, certainly on par with the great Box Whisky The Festival 2014.